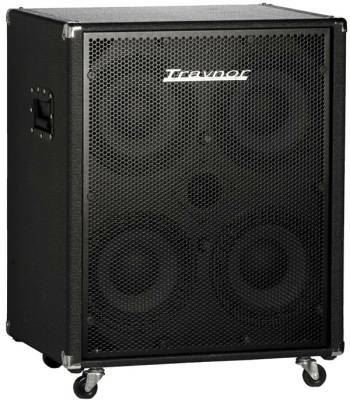 Traynor's top-selling TC410 delivers best-of-all-worlds performance for virtually any bass sound. Solid bottom end comes from four long excursion 10-inch drivers while crisp highs from the conical horn can be precisely control-regulated for any balance you prefer. This means the TC410 can cover any playing application. And for a wall-of-bass rig, dual TC410s provide a 2-piece, 1600-Watt 810 stack that can rock the roof. Or optionally the TC410 can be combined with a TC115 for a classic 4x10/1x15 stack. Made in Canada with a 2-year North American, even-if-you-blow-it warranty on all components and that covers cabinet integrity for a full ten years, the TC410's 11-ply construction, an all-metal grille, removable heavy-duty casters and all-metal flip handles ensure unmatched reliability over the long haul. I power this bad boy with my Gallien Krueger 1001rb. It is the best amp-cabinet combination I have ever run with. I have owned the 2x101x15 cabinet, the 8x10 refrigerator and countess other cabinets and this is by far the best I've used yet. The 8x10 is great but such a pain to store and move around. Just get the TC410, the sound and power is incredible. With the 1001rb pushing it, I can barely put it past 1 on the volume when I'm in the house. Fantastic amp, great Canadian company and a great store to buy from. Go to the new Long and McQuade in Kingston Ontario and see Gerry Nontell. He was super knowledgeable, didn't make me feel rushed and encouraged me to try a bunch of products out until I found what I wanted! After buying a tc210 to complement my old yorkville xs400, i decided to upgrade my kit a bit. I bought this cab to use with the tc210 and a Little mark tube 800 head. It just wants to take your head off! The tone on this kit is crystal clear. I've always been against putting tweeters in bass cabs but the level control on the cab helps a lot in different types of rooms to get the clarity you need to get through in the mix. The only downside on this cab is the weight. 100lbs! I don't know how many shows I have played with this beast, but I have owned it for almost 5 years. I think that it is an excellent cab, it still sounds great and has even survived a crash down the stairs. Great amp!